Bring swing fun to your littlest special needs kids with this heavy duty JennSwing structure, an accessible dual swing structure. The frame of the structure measures 12′ 9-1/2″ long and 8″ high. It’s made from tough steel tubing. The horizontal bar measures 2-3/8″ outer diameter, and the legs measure 2″ outer diameter. The end frame fittings and top rails are powder coated, and they’re available in red or green. This structure is built for outdoor use, to be embedded in the ground with concrete (but the Single Swing Model may be used indoor, if you purchase the optional swing feet). The height of the beam is 8 feet above ground level. If you need another height, different heights are available upon request. Note: The structure comes with swing hangers (which clamp to the horizontal bar), but both the chains and the swing seat are sold separately. 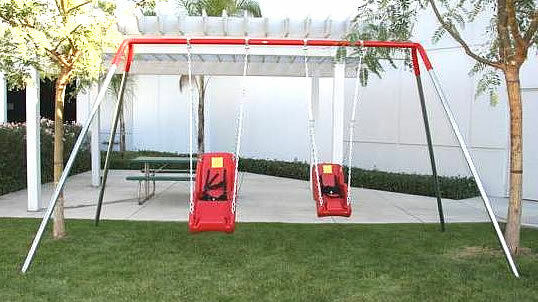 Call us with questions about the ADA Child Swing Frame TOLL FREE!